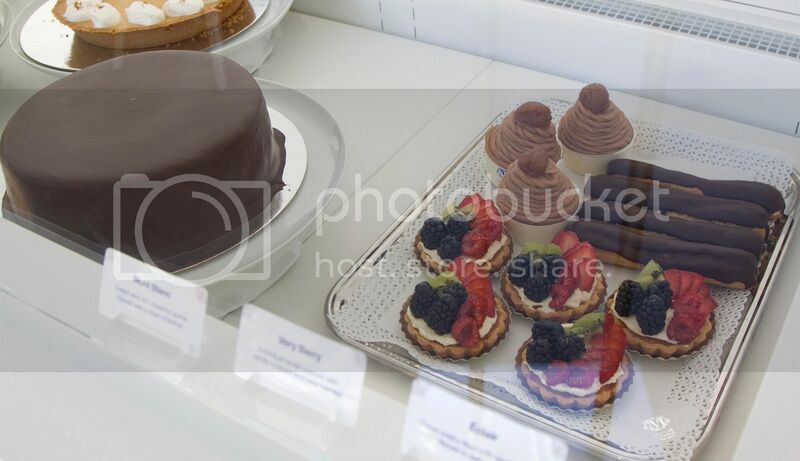 Lady M Confections is a well known dessert store with vast media exposure such as Allure, Brides, Travel + Leisure, and New York - Best of New York. 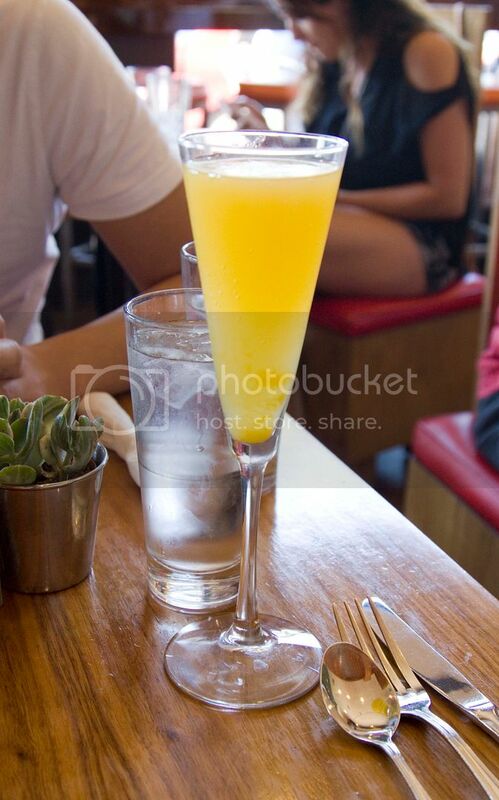 The very first location was established in New York and now Lady M has a total of four outlets. 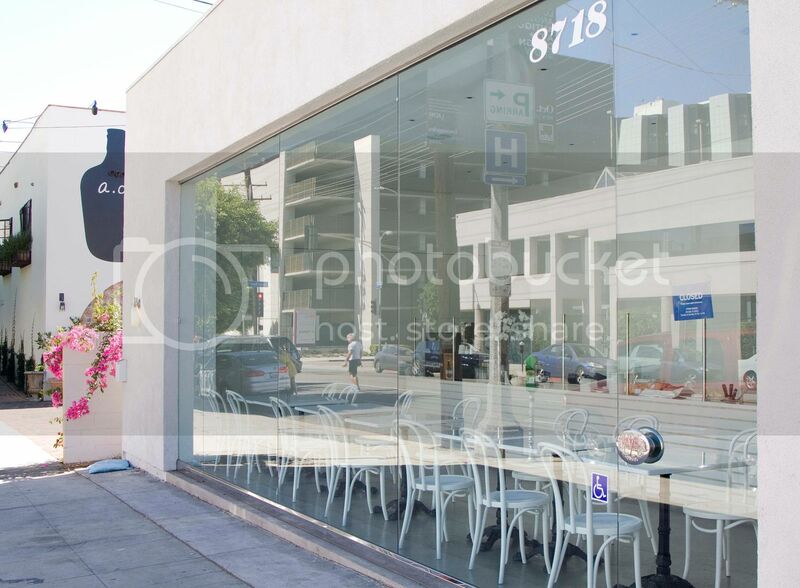 The latest opening is its first west coast store opened this summer in Los Angeles. 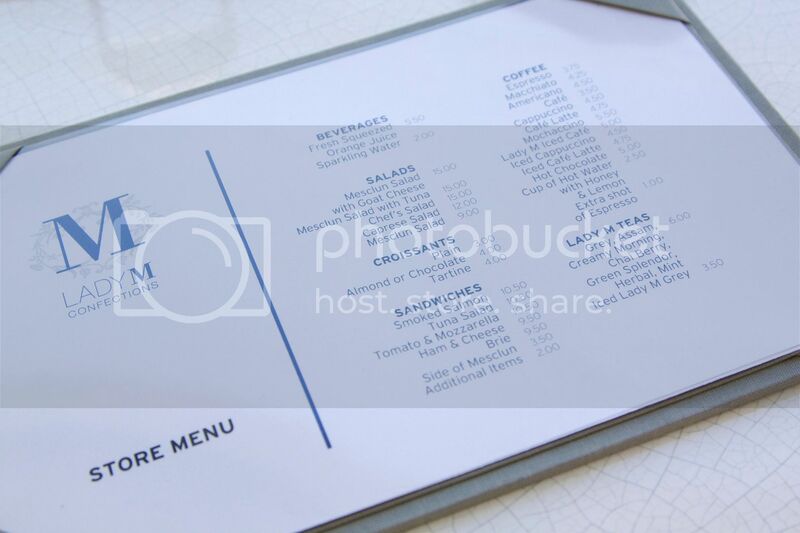 Minimal white color based store design and rectangular shaped layout are the general theme for Lady M, for both East Coast and West Coast outlets. We arrived right when the confection opens at noon. It's not as crowded as it first opened during summer. 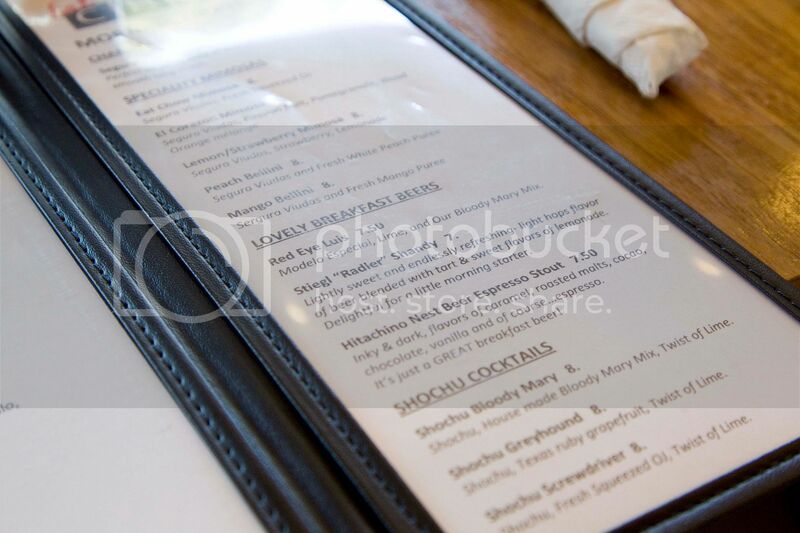 However, steady customers starts to fill in the store soon after, mostly for take outs - large quantity take outs. 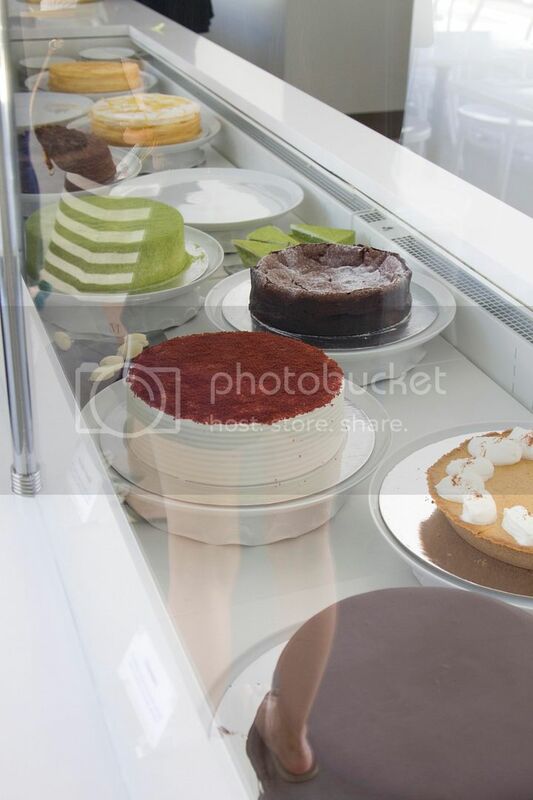 I read a Yelp review saying that Lady M was overflowed with Asians and a good portion of them were taking pictures of the cakes, which created a weird scene at the store. Well, it's true, and I was among one of them (but I did ask the waiter if pictures are allowed). Lady M is pretty big among Asian communities. There were Koreans, Taiwanese (raising my hand), Japanese, and Cantonese at the store during my short 1 hour stay. It might be wise to arrive early still in case your piece of cake got taken away by one of my kind! 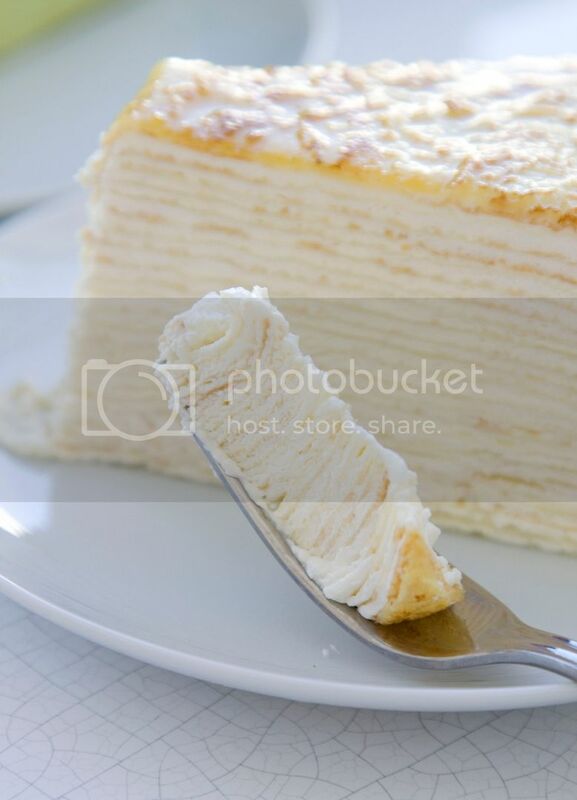 Mille Crêpes is what this confection is famous for. 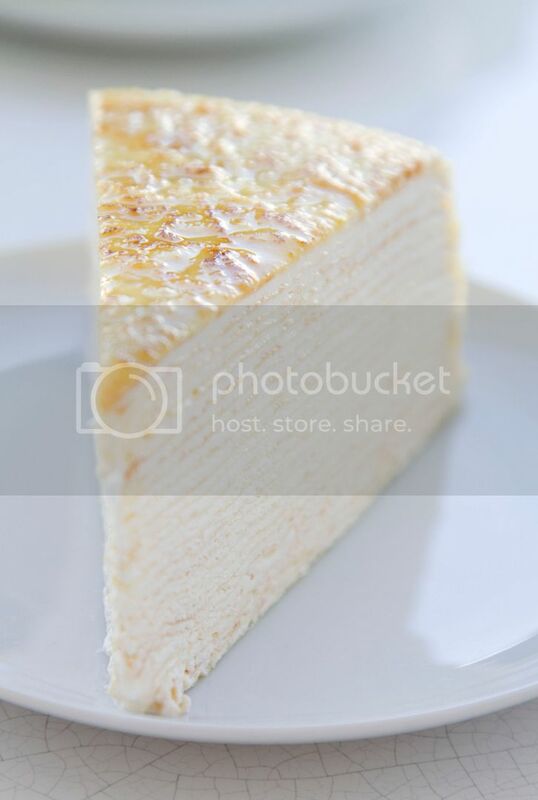 Created by gently piling up 20 layers of paper-thin crêpes coated with pastry cream. Besides Lady M's signature original mille crêpes, currently it also comes with citron, chocolate, green tea, marron (sweet chestnut), and strawberry flavors. The chocolate banana flavor not yet available in Los Angeles. Lady M also carries other type of delicately made dessert. 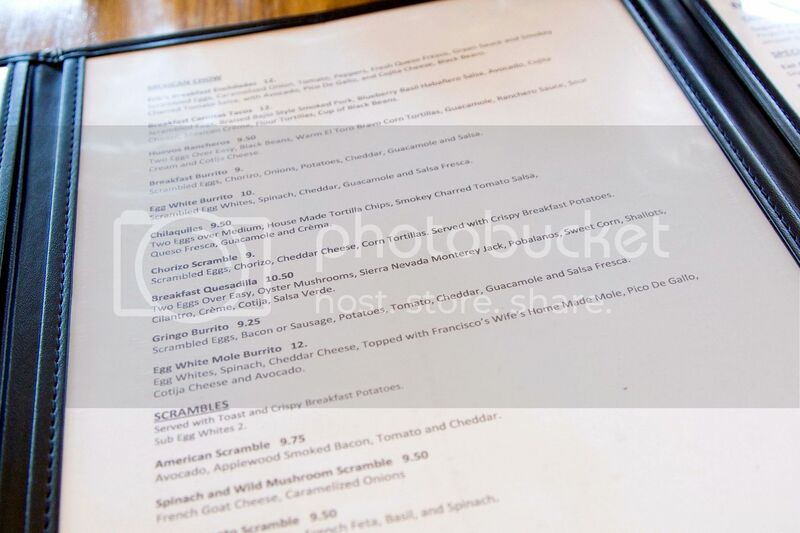 Light savory items such as sandwich and salad are also available for dine in customers. 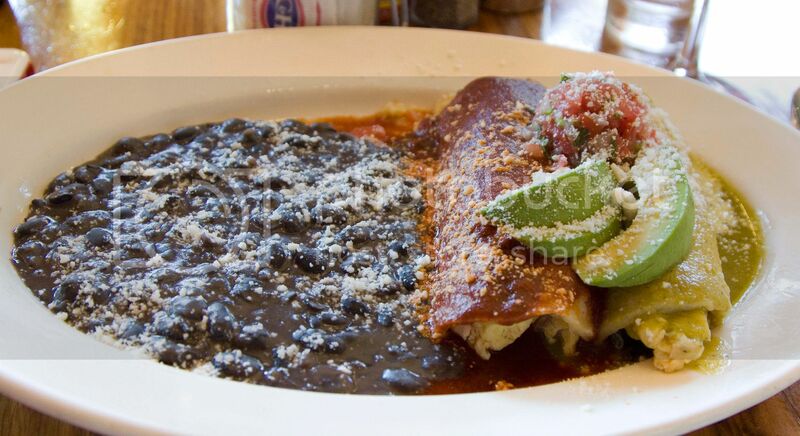 My mouth is watering just by staring at the picture. The crêpes is light, creamy, and with a slight caramel hint from the top layer. It's not overly sweet like some of the American cakes, which is ideal for a creamy treat like this. That way you won't get sugar stuck on your tongue feeling even till the very last bite. 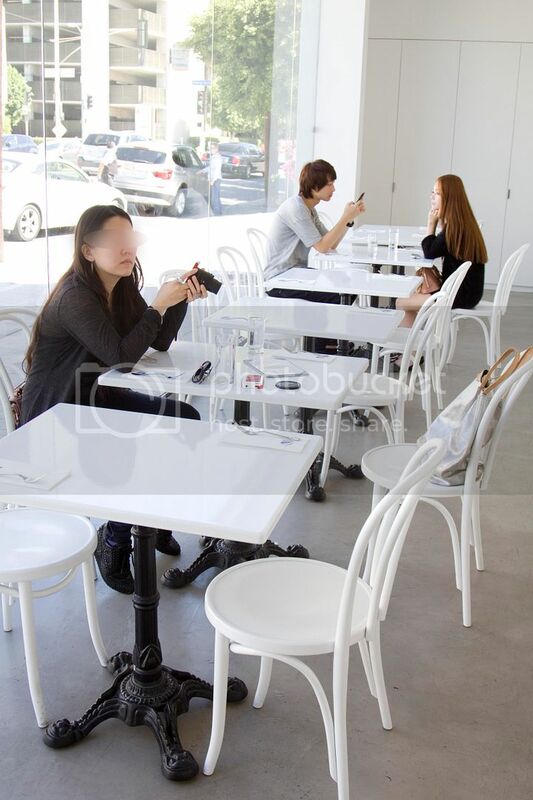 Asian girls' picture taking mode. I would say the green tea version tastes even less sweetened, partly due to the slight bitterness from the matcha powder. 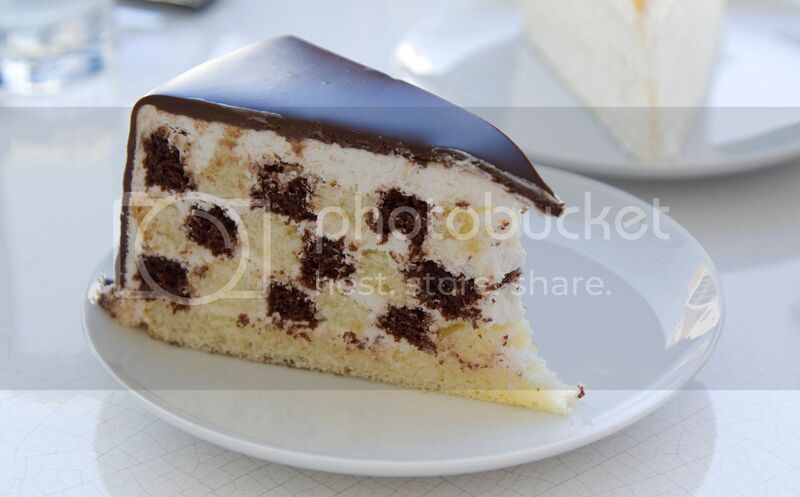 Look at these paper thin layers, some might think $8 is very expensive for a slice of cake. However, you can tell how much work and precision goes into that one little crêpes. Don't even mention the quality of ingredients used. I think such a true delicacy definitely worth $8. 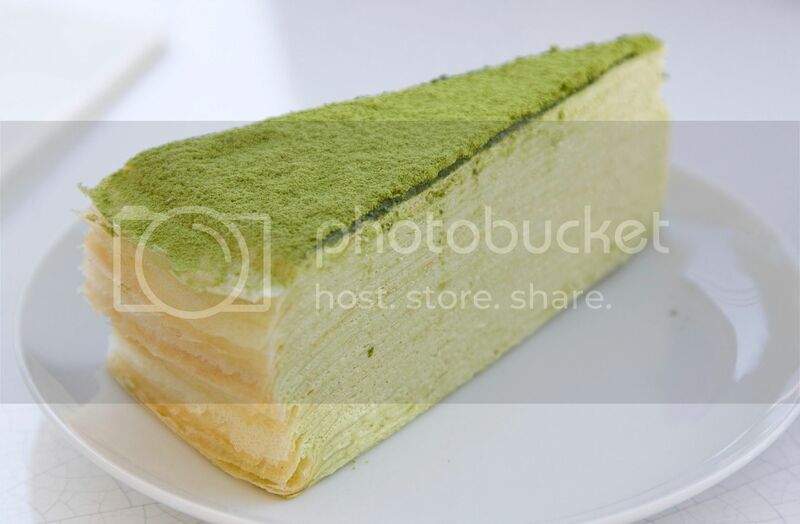 For your reference, a 6 inch green tea mille crêpes costs $45 and a 9 inch one costs $80. Made with vanilla sponge cake, chocolate sponge cake, and whipped cream throughout. To make it even better, the whole cake is covered with shining dark chocolate ganache. 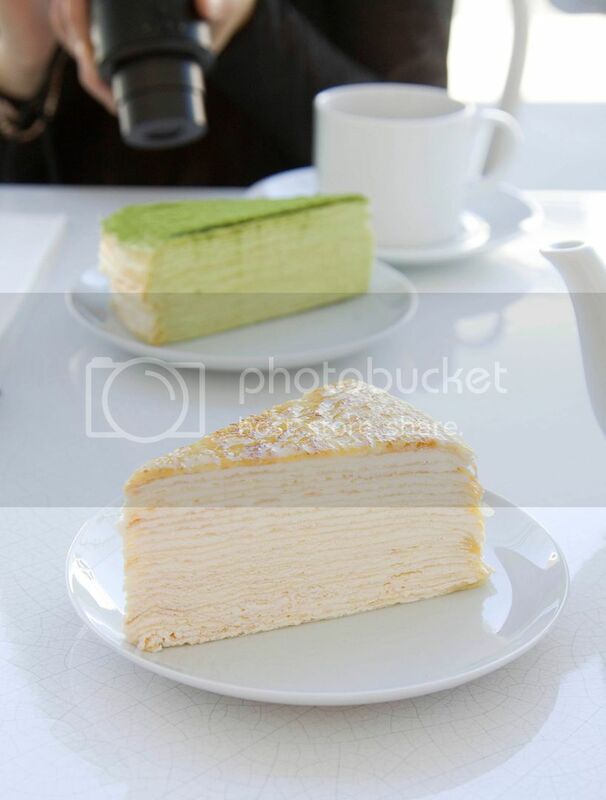 The cake itself is as good as the crêpes, I only wish the person who cut our slice can do a better job, so we get a cleaner color separation between the two flavors. This one is pretty ordinary. You can still taste the quality chocolate used in the cake, but overall it's not as palate-blowing as others. This place is definitely worth a try. 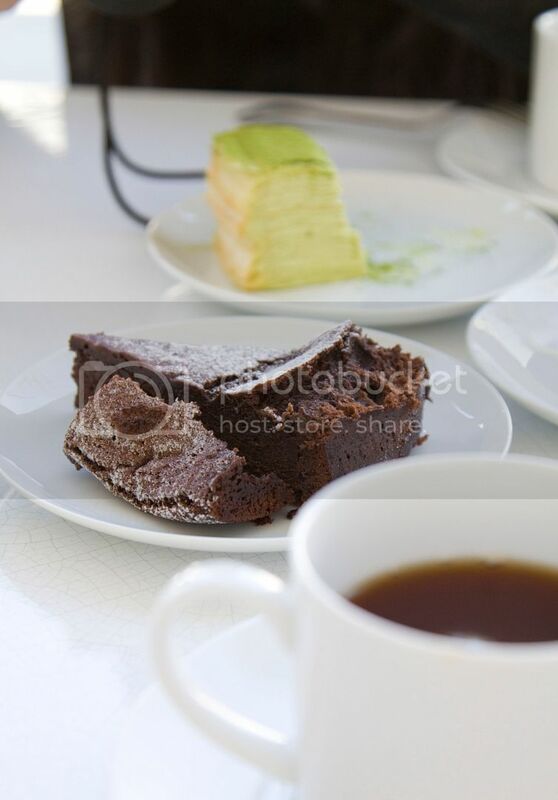 The cakes and crêpes are light and delicate, similar to Japanese style cakes. However, the ones from Lady M are well flavored with its signature luscious cream, making the cakes light yet packed with delicate flavors. Tue to Fri from 12 noon ~ 7 p.m. 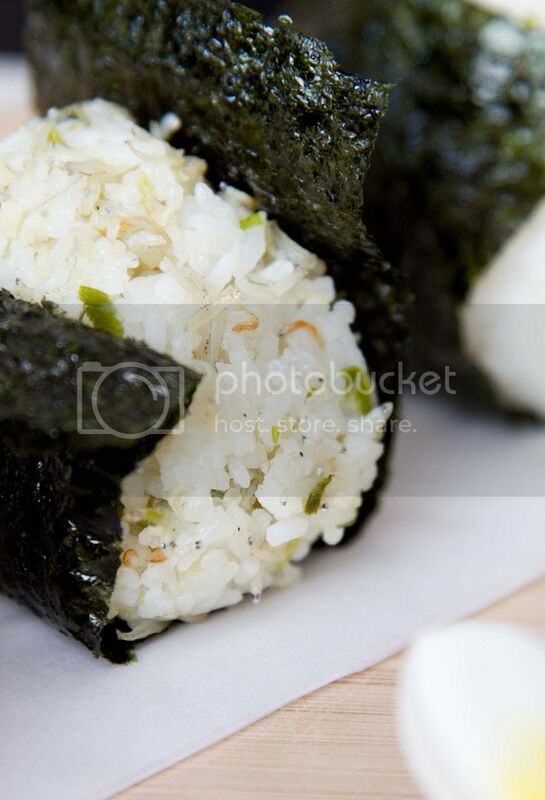 Sat to Sun from 12 noon ~ 6 p.m.
Onigiri means rice balls, usually wrapped with a piece of nori, or dried seaweed. 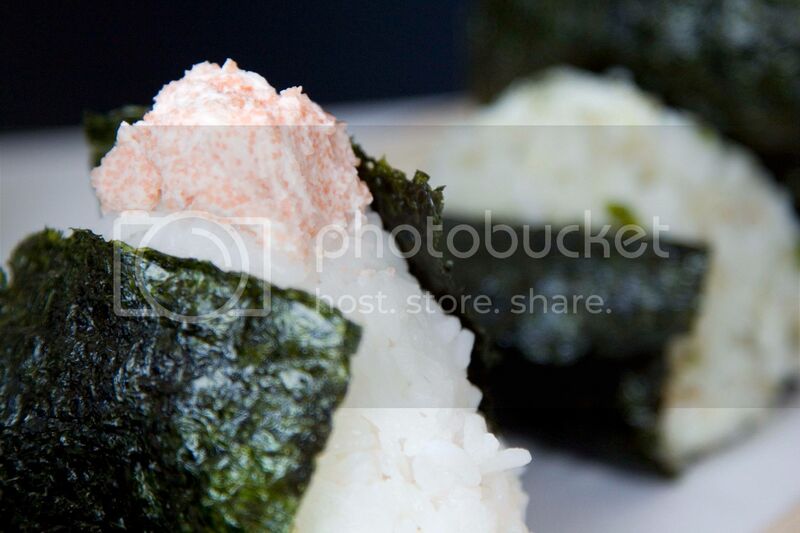 There are a wide variety of fillings that can be used with onigiri. 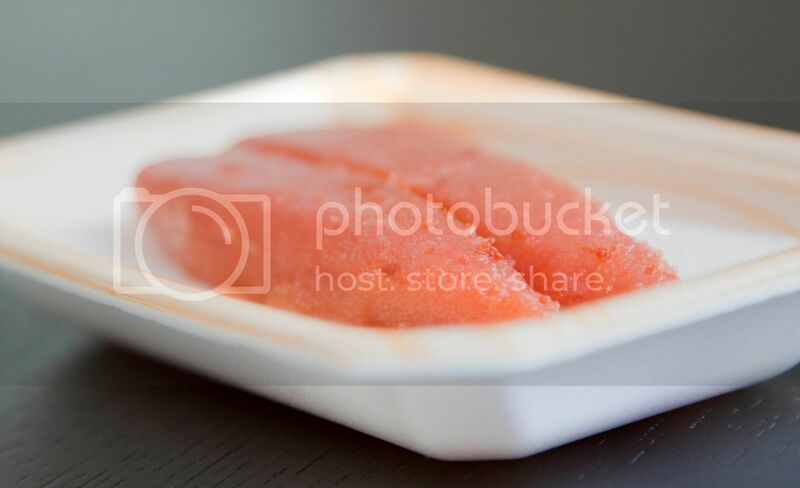 The most simple and traditional options including umeboshi (picked plum) and salted salmon. However, a fancier or even fusion style onigiri is on the rise. Don't be surprised if you find snapper or even Mexican carnitas wrapped in steamed white rice. *This is a very old recipe for stir fry shirasu, but for sure the flavor stands even years after! Carefully remove the membrane from the mentaiko. I simply cut a small opening towards the end and squeeze out the fish roe inside. 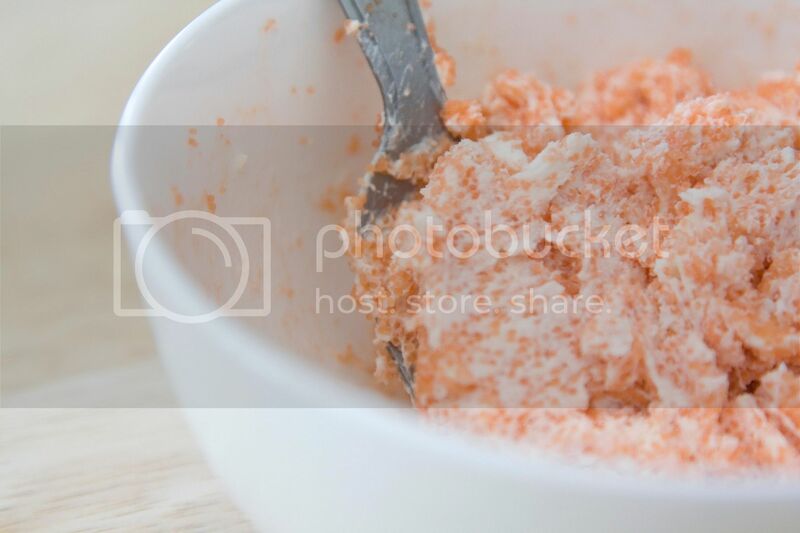 Mix the fish roe with some room temperature cream cheese, about 2 tablespoons. Use more if a creamier taste is desired. To recap the recipe for stir fry shirasu, simply peel and finely chop some garlic cloves, finely chop a few red chilies and about one stalk of scallion. Drizzle just enough olive oil to coat the bottom of the pan. Add in the garlic, chilies, scallion, and cook till the aroma comes out. Add in one small pack of shirasu and sprinkle with some salt to adjust the taste. Make sure to avoid using shirasu that has been dried completely otherwise the texture will be too tough for onigiri. 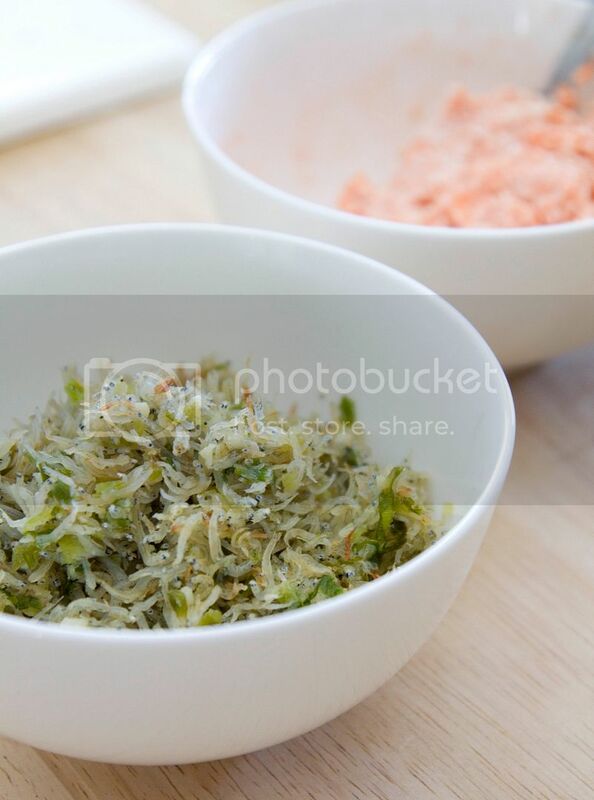 The less dried and cooked version is white, instead of the dark grayish dried fish. 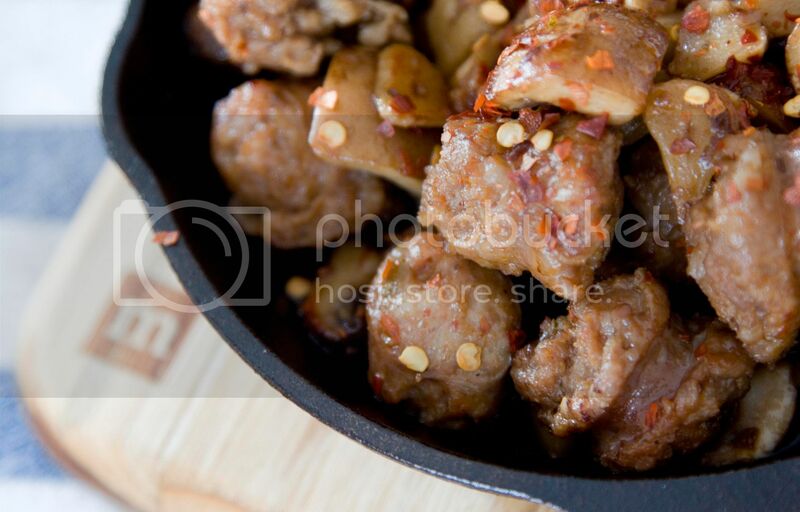 However, when cooking this dish, make sure to sear the shirasu till almost dried out. The sides should appear slightly golden colored. That way the aroma gets locked inside the fish. Cook the white rice as usual, use about 2 cups. You can even soak the rice for 15 minutes before cooking in the rice cooker in order to create an even sticker texture for onigiri. Wait till the rice cools down to the point where you can handle by hand. Take half of the rice and mix in the stir fry shirasu. 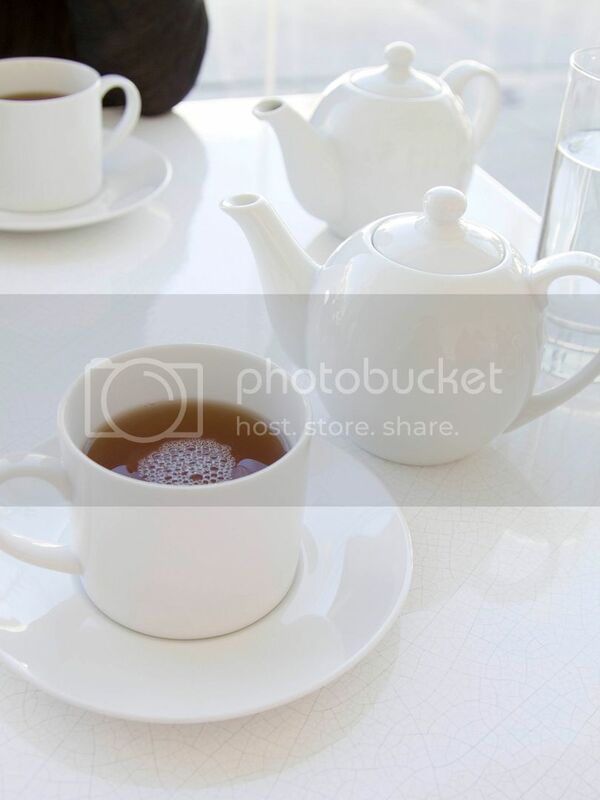 Prepare a small bowl of salt water, make sure to use the already boiled water. Slightly wet both hands with salt water, which will help to avoid having rice sticking on hands. Form the shirasu rice mixture into small balls and wrap each one with one piece of nori. To make the cream cheese mentaiko onigiri, take about half amount of rice for the onirigi in one hand, scoop some cream cheese mentaiko into the center, and take some more rice to cover the filling. 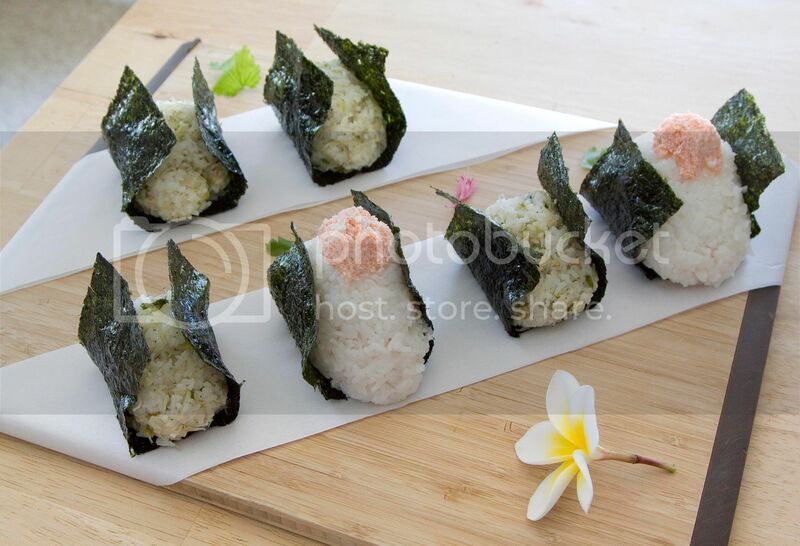 Form the rice into triangle shaped onigiri, this might take some practice. Wrap the onirigi with nori. I also added a small spoonful of the mentaiko mixture on top, looks more appetizing that way (or just my other excuse to have even more cream cheese mentaiko in one onigiri). You can pack the onigiri inside lunch boxes. 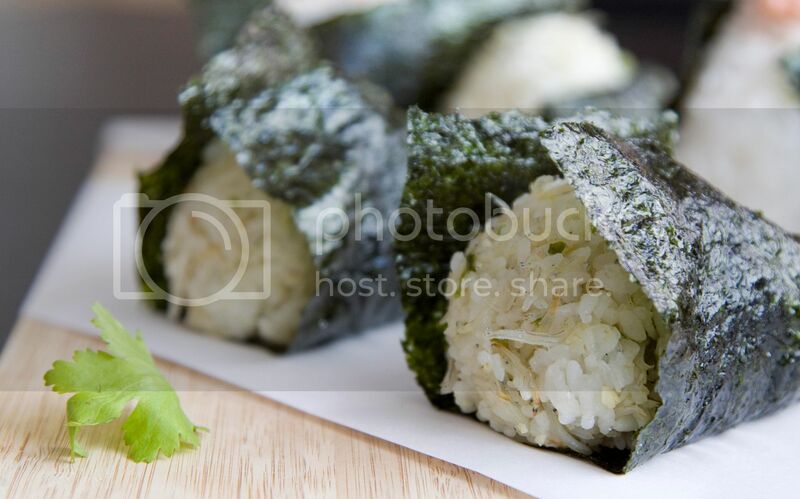 In fact, onigiri is one of the most popular lunch box items in Japan! Just make sure to pack the nori separately so everything stays nice and fresh. 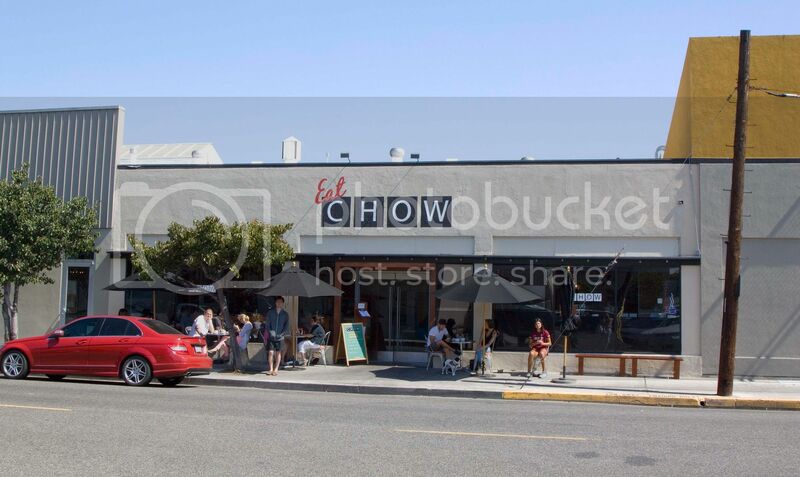 Currently there are two Eat Chow branches, one in Costa Mesa and the newer establishment is in Newport Beach. The Costa Mesa joint is located between Newport Blvd and E. 18th Street. You'll find it easily right after making a turn on E. 18th street since it's like the only restaurant facing this direction. The rush hour crowd waiting outside the restaurant should also signal that the destination has arrived. 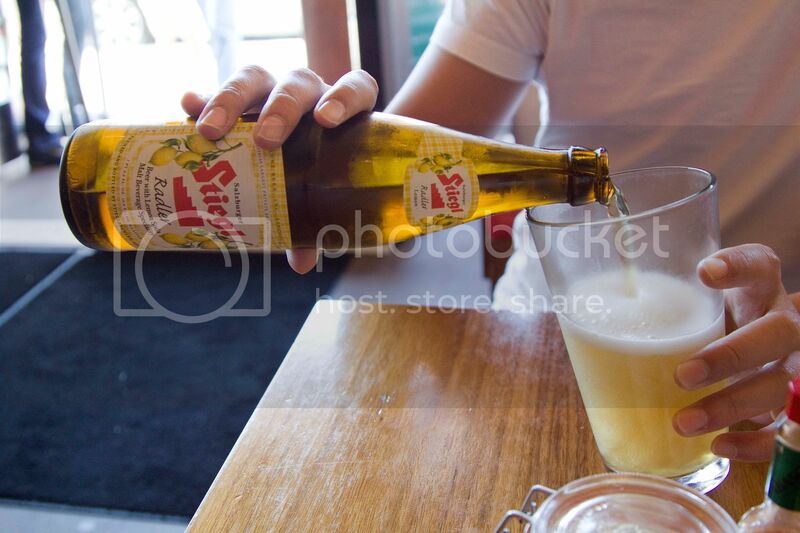 "Lightly sweet and endlessly refreshing-light hops flavor of beer blended with tart and sweet flavors of lemonade." There are several flavors, the one here is lemon and it sure tastes refreshing. The flavor resembles bubbly lemonade with no bitter-ish aftertaste, highly recommended. "Segura Viudas and fresh white peach puree." "Eggs, caramelized onion, tomato, peppers, fresh queso fresco, green sauce and smoky charred tomato salsa, with avocado, pico de gallo, and cojita cheese, black beans." 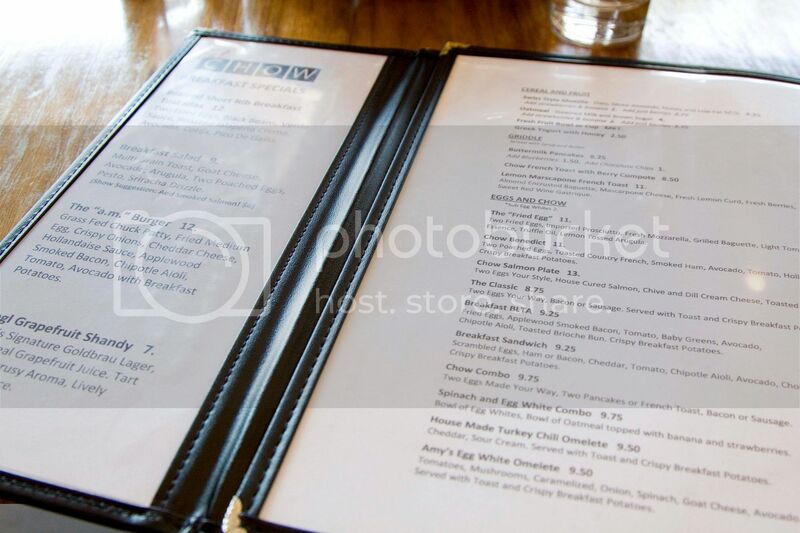 Just by looking at the words "fried eggs," already making me salivate for this dish. 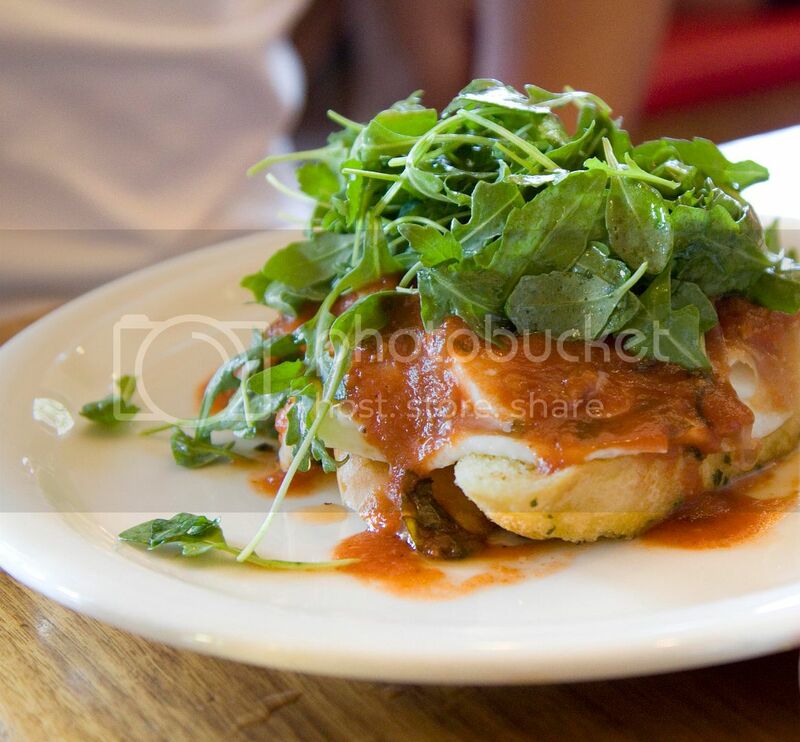 "Two fried eggs, imported prosciutto, fresh mozzarella, grilled baguette, light tomato essence, truffle oil, and lemon tossed arugula." Another highly recommended item. We waited for about 15 minutes by the time we arrived at the restaurant a little pass 10 on a Saturday morning. There were more people waiting when we were about finished and the late lunch rush is just about to begin. 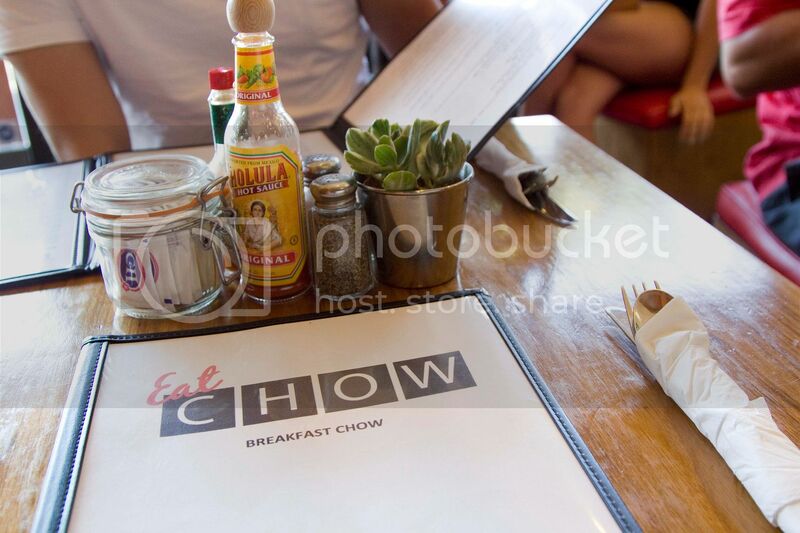 If you would like to visit Eat Chow for lunch during weekends, note that lunch starts serving at 1 p.m. I'll definitely come back to try out some of the items from Eat Chow's lunch and dinner menu that are not available during breakfast hours. Cheesy tots, beer battered onion rings serviced with Point Reyes blue cheese dip, and five cheese mac "n" cheese just to name a few! 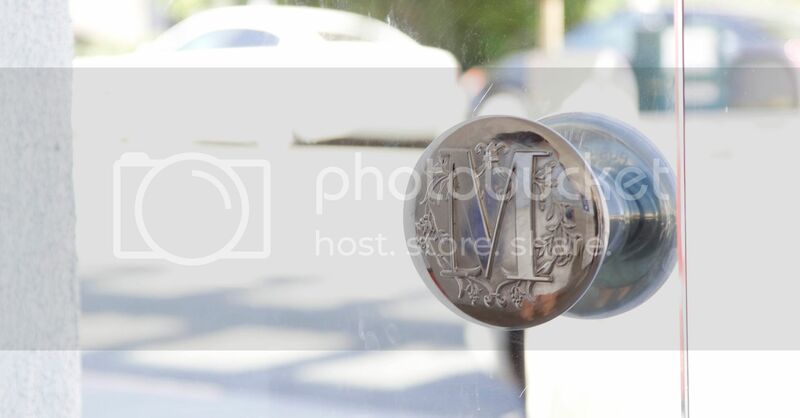 *Driving direction might guide you to turn on East 18th Street. It's a side street so make sure to keep your eyes wide open and not to miss the turn. Sunday - Thursday 7 a.m. to 9 p.m.
Friday and Saturday 7 a.m. to 10 p.m.
Monday - Friday 7 a.m. to 11 a.m.
Saturday and Sunday 7 a.m. to 12:30 p.m.
Monday - Friday starts at 11:30 a.m.
**Saturday and Sunday starts at 1 p.m.
Two mini iron cast pans were recently added to my kitchenware collection. I was holding down my urge to test out the pans immediately. Instead, I washed the pans and let them air dried overnight. If you ever used iron cast pans, you'll know what was the shocking view the next morning - two rusty iron cast pans with gloomy orange spots all over!! That's right, it's my first time using a true iron cast kitchenware that's not coated with enamel. Quickly googled the solutions then I realized that uncoated iron cast pans are very vulnerable when in contact with moisture. Basically it gets rusty easily. So easily that you might even have to leave the cookware over fire to dry out any remaining liquid before storage. So I followed the steps and reseasoned the pans with oil, made sure they're 100% dried, wiped with a kitchen towel, and finally store them away. So much work for these two mini pans! After restoring the iron cast pans back to its "healthy" stage, it's time to put them to work! Chorizo actually works the best for this recipe. However, I was at Whole Foods and one chorizo costs almost $10!! 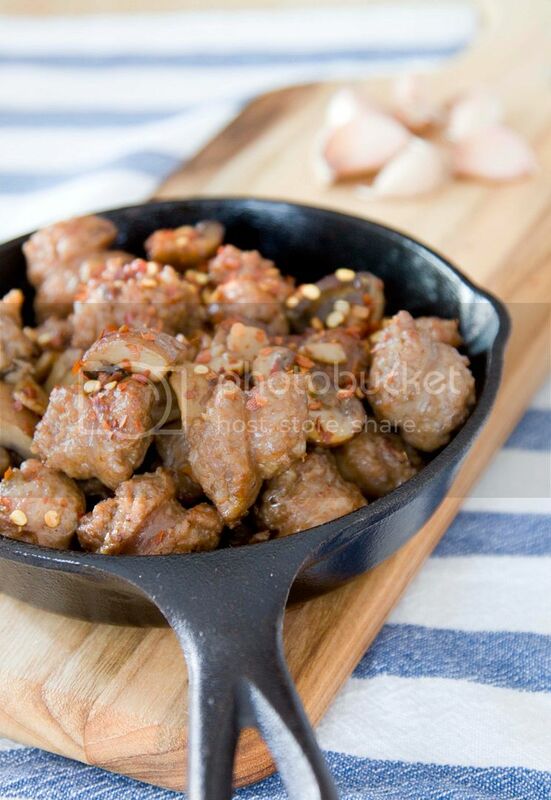 To be a more budget sensitive shopper, other types of spicy sausages should do the tricks just as well. They have to. Peel and roughly chop the garlic cloves. Quarter the mushroom. 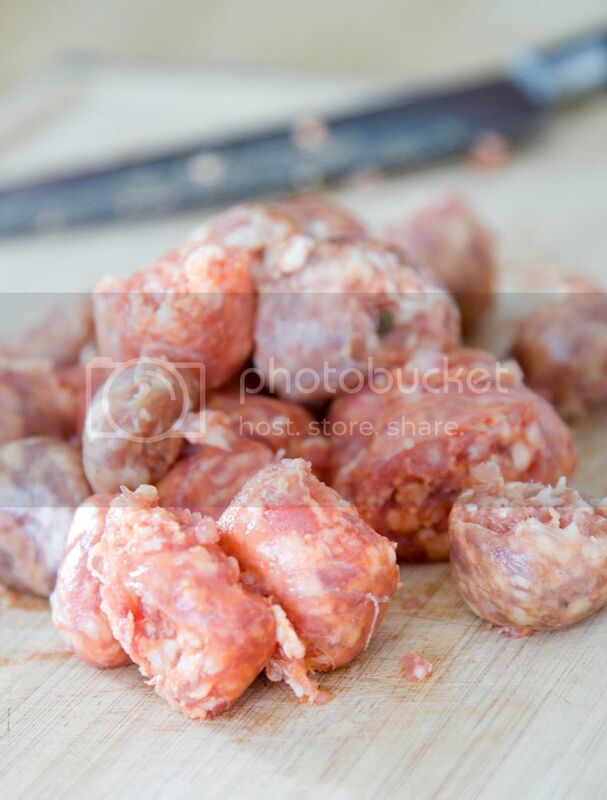 Cut the sausages into bite size pieces. They don't have to be chopped perfectly. In fact, rough edges fit better with this whole bar food theme, and my rusty iron cast pans. Pour the bacon fat or olive oil into the iron cast pan and turn to medium high heat. Add in chopped garlic and sprinkle some salt then give it a quick stir. 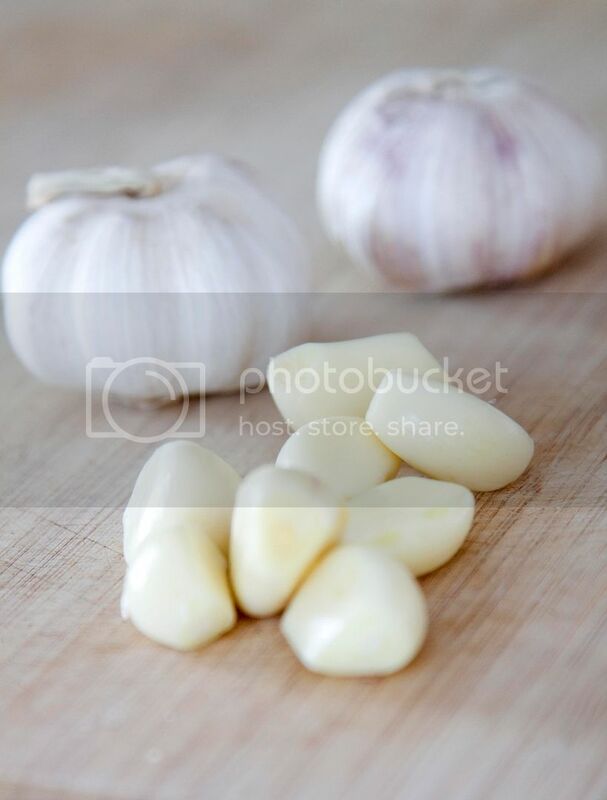 Cook till the edges of the garlic turns slightly browned. Add in the sausages and cook till about 70% doneness. Add in the mushroom and cook for another minute or two, or till the sausages are about to get burned on the edges. Mushroom should shrink by half by the time this dish is ready. Garnish with some chopped parsley if desired. I only use red chili flakes here to pump up the heat. You can also add some halved cherry tomatoes together with the mushroom, it'll add a nice acidity to the dish. Here's something to warm up not only your stomach but also your heart! Don't worry about finding a hand held blender for this recipe. A regular juice blender will do the job just fine. Peel and chop the onion into big cubes. Peel and chop the garlic cloves. 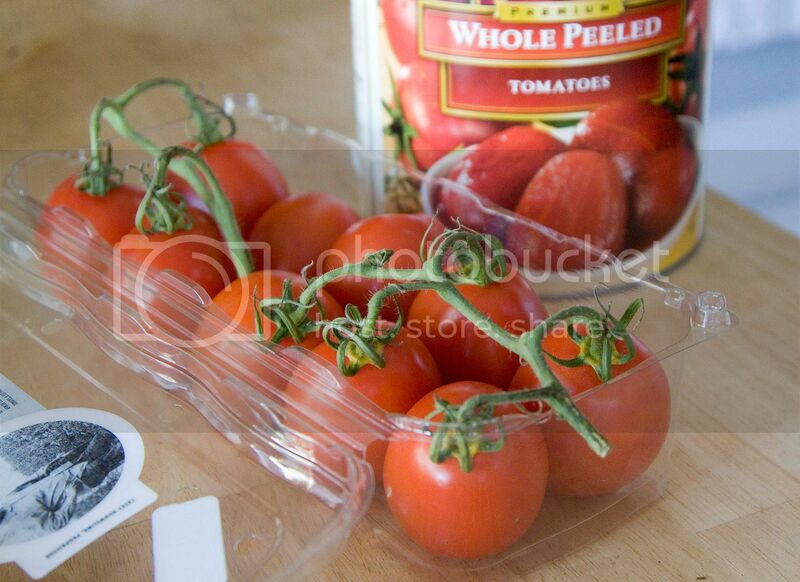 Remove the stems and chop the fresh tomatoes into medium sized cubes. Fresh Roma tomatoes are slightly sweeter than the regular big and round shaped tomatoes. 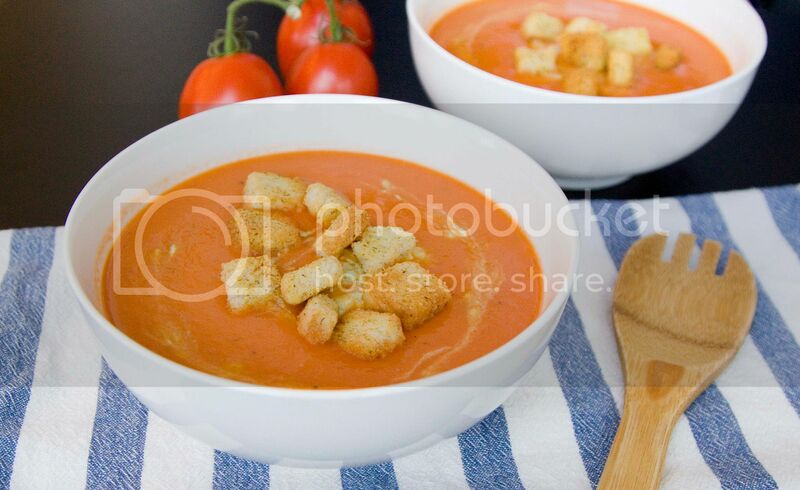 To balance the flavor, I've also used one of those round shaped tomato to increase the acidity for the bisque. Drizzle about 2 tablespoons of olive oil to a big soup pot. Add in the onion along with some salt and pepper. The freshly ground black pepper will add a nice heat and warmth to the soup. 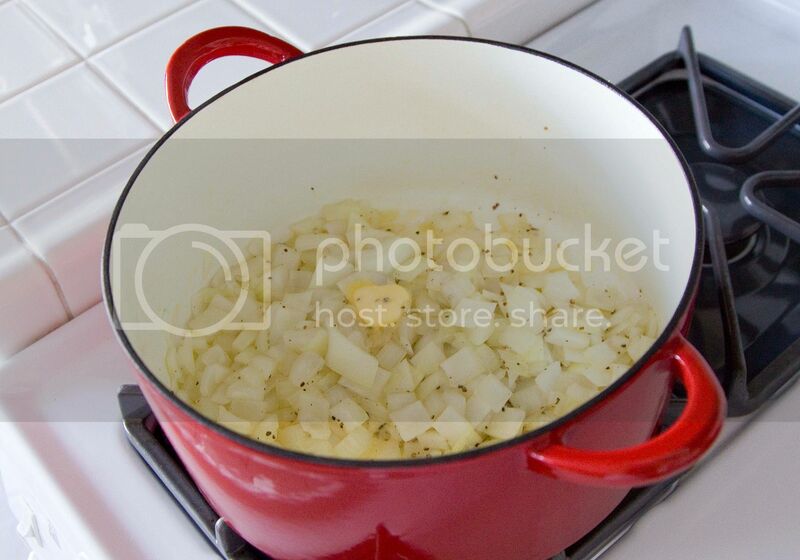 Give it a quick stir and cook till the onion turns translucent. Add in the butter and chopped garlic. Cook for about 1 minute. 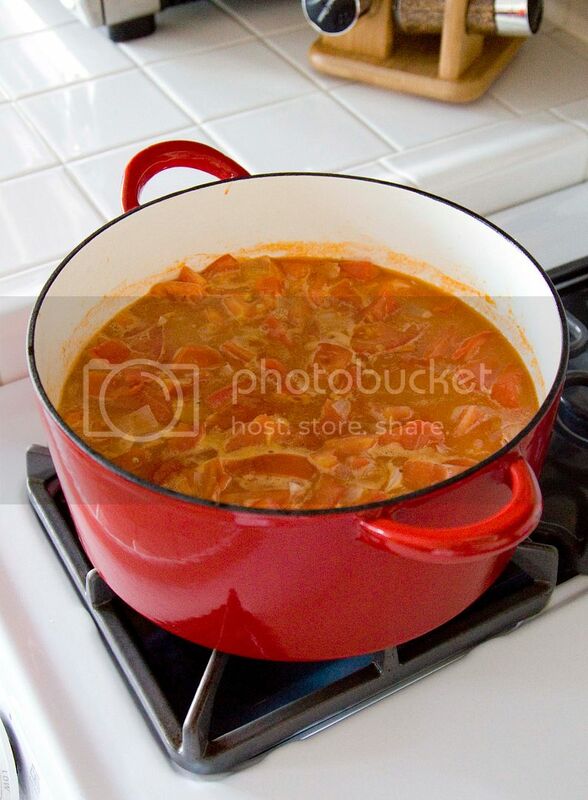 Add in chopped tomatoes, canned tomatoes along with some juice, and chicken soup. To give you a better idea, I actually counted that there were about 8 peeled Roma tomatoes in my 2 cups of canned variety. Don't worry about chopping the canned tomatoes, you can also use a spatula to break them apart during the stewing process. Otherwise everything will get blended till smooth in the end anyways. Bring to a boil then lower the heat to keep the soup simmer for about 20 more minutes. Blend the soup if you have a hand held blender. Otherwise, if using a regular juice blender, turn off the heat and wait till the soup cools down. Carefully scoop the soup and all the yummy goodies inside to a blender, just a few ladles at a time. Blend till desired texture and pour to a big container. Repeat the steps till everything has been blended. Make sure not to overfill the blender because the residual heat will create some gas, which might result in somewhat dangerous tomato explosion in the kitchen. Just a little bit at a time and you'll be safe and sound. Pour the blended soup/bisque back to the pot. Reheat before serving. 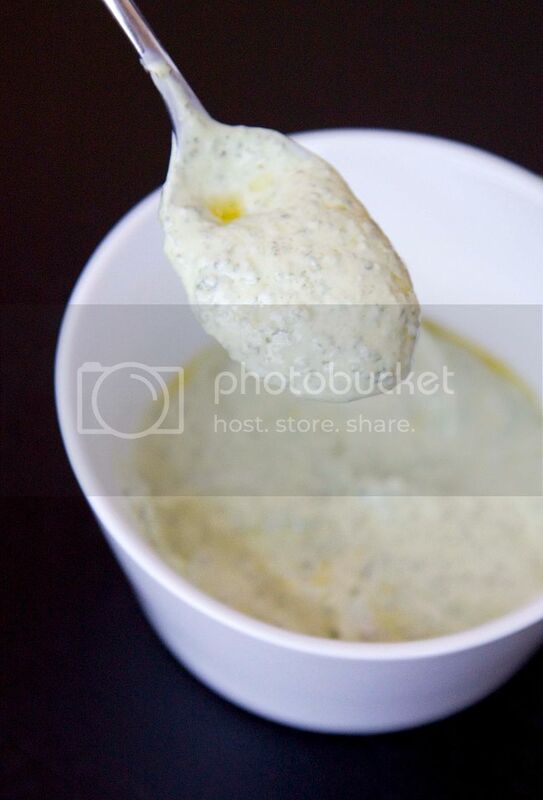 For the basil yogurt that goes with this recipe, simply blend the basil and yogurt in a food processor while drizzle some extra virgin olive oil at the same time. Blend till desired thickness. The thicker version will gradually melt into the soup. 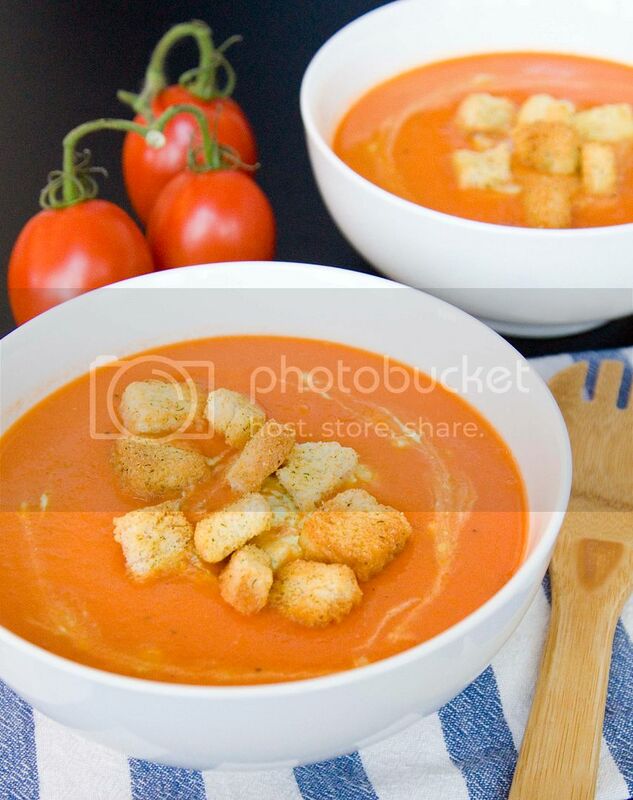 The thin and oily version "floats" better on top of the soup, looks prettier. As for the crouton, there was no leftover bread in the house so I just used store bought croutons. 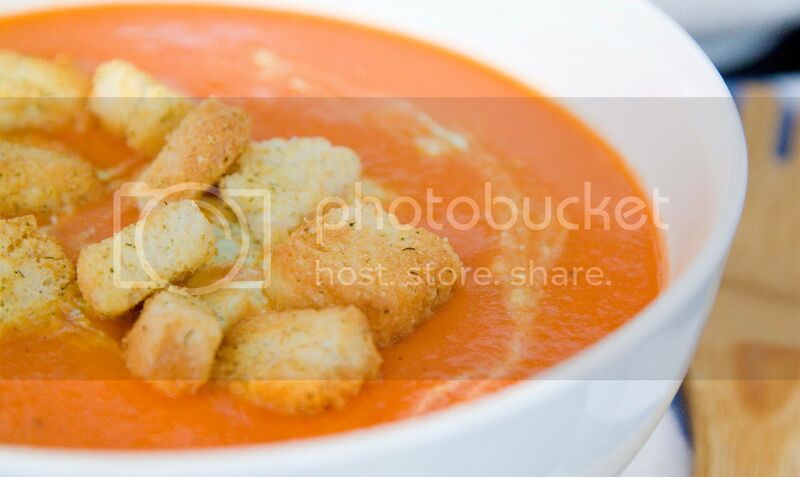 The size is definitely too big for my bisque, but they do taste good with that extra Italian herb infused in the croutons. If you're making croutons, just take a day old bread and cut into small cubes. Lay them on the baking sheet and drizzle with some olive oil. Bake with high heat in the oven and they'll be ready when the color turns slightly golden brown on the edges. 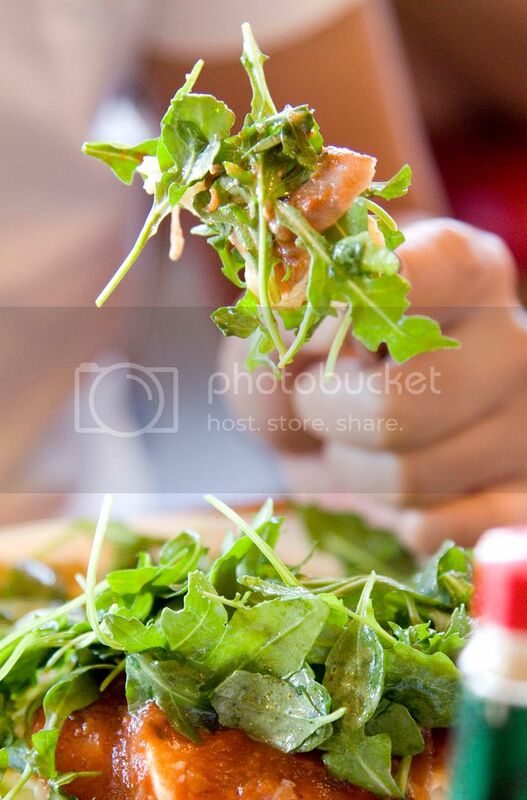 Make sure to only add the croutons right before serving so it'll stay nice and crunchy.